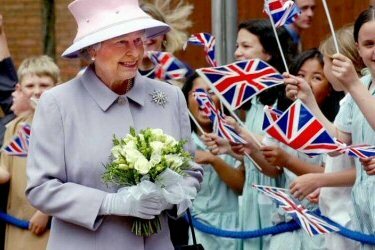 Queen’s Diamond Jubilee 5.0 out of 5 based on 1 votes. The celebration will mark the monarchs 60 years on the throne, will give Brits the a four day break. It is hoped that millions will join in the celebrations, which mark the start of a ‘feel good’ summer culminating in the Olympic Games in London. But business leaders have criticised the move saying it will damage firms during a period of economic downturn. One of the highlights is expected to be The Big Jubilee Lunch, for which neighbours will be encouraged to share a meal. It is to be launched by the Palace and environmental and educational charity the Eden Project. A Royal source added: ‘Local celebrations have always been part of previous Jubilees. ‘People particularly remember the street parties in 1977 for the Silver Jubilee and grassroots celebrations in 2002 for the Golden Jubilee. A further highlight of the Jubilee celebrations is likely to be when the Queen’s Royal Barge leads a flotilla of more than 1,000 boats along the Thames on Sunday, June 3. It will be the largest river pageant to take place in Britain since the reign of Charles II. The Queen, who will be 86 when she marks 60 years on the throne, is due to become only the second British monarch to celebrate a Diamond Jubilee. The first was Queen Victoria in 1897.